A little Too Late was a beautiful story of two broken people falling in love. Author Staci Hart tells this story like a slow burning candle, full of beautiful words and moments of love. I love this story from beginning to end. Hannah was sweet, beautiful with a heart of gold. Most of all Hannah just wanted to belong to a place that she can call home and a man that would make her feel at home. Then there’s Charlie, a broken man who never thought would find love again, but he did with Hannah. Hannah was an easy person to care for and to fall hard for. So when these two crossed the line from Boss and help, it was expected. They fell for each other easily, being around each other and living life was easy as breathing. Together they made sense, they were like chords in a song that wouldn’t sound complete without one another. "I love you for the way you have filled my life with joy, for the kindness and grace you breathe into everything you do." 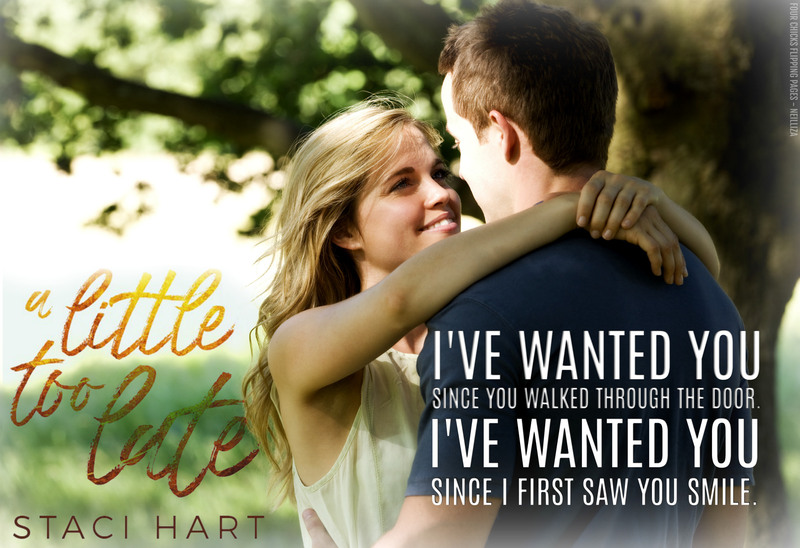 A Little Too Late is really a beautiful story of a second chance in love and is my new favorite from Staci Hart. I love how she told Hannah and Charlie’s story. The calm of their story, to the explosion of their love. Beginning to end, is perfect. I’m glad I read this. A breathtaking, sentimental emotional love story that was brimming with so much honesty, beauty, and passion. Staci Hart delivers one heartwarming love story that stole my heart right off the opening pages. She made readers feel for her characters and in such the chemistry between the characters were so intense, palpable, and tangible that you can’t help but fall in love with Staci’s writing and characters. A Little Too Late is an exemplary love story that showcases the beauty of love, hope and new beginnings. A must read for any romance fans.